Rowan was born on the 26th May 2011, 11 days early in a birthing pool weighing a tiny 5lbs 6oz. For the first 6 months of her life everything seemed normal. However, at 10 months old Rowan was diagnosed with Spinal Muscular Atrophy Type 1 b after we had noticed she wasn’t meeting her physical milestones as her peers were, she couldn’t roll over or sit up and showed no interest in holding objects nor could she hold her head up fully. Rowan had however been breastfed since birth up to 10 months old and was fully weaned onto solid foods. She had previously only had one chest infection and no other medical problems. Even with this condition Rowan was lucky enough to have movement in her arms and face and had the most amazing repertoire of sounds and chatter. She enjoyed life with the assistance of a special chair that helped her to play and be involved in the world. Rowan was a lively and bright baby, and always had a smile and wave for everyone. She loved bubbles, reading, bathtime and swimming. 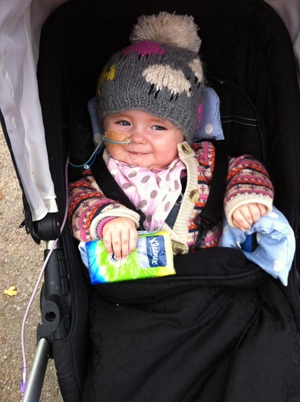 Rowan became poorly in June 2012, she had been a little unwell the previous day and was particularly sleepy and fussy. Rowan was treated in our local district hospital for pneumonia and thankfully she responded to treatment fantastically, after 11 days on the Children’ ward we were discharged. Again on the 20th September we were concerned about Rowan's breathing, we felt that in June we left it too late to take Rowan to hospital and she had become very poorly however this time she was her chirpy smiley self it was just her breathing that wasn’t quite right. We took her to A&E where she was quickly treated but she showed little sign of improvement and it was decided that she would be taken round to intensive care to use a Cpap machine to try and help with her breathing. Early on Friday 21st September it was decided that Rowan should be ventilated and sent to ICU at a specialised hospital as the Cpap machine had failed to help her. Rowan remained on the ventilator for 7 days at the specialist children’s hospital, everyday we were taken into a side room to discuss Rowan’s current situation and always prepared for the worst situation, that she would not successfully come off the ventilator. It would seem that the common cold had led to complications because of the SMA. Rowan proved every doctor wrong and came off the ventilator and successfully onto a non invasive ventilator. However, things took a turn for the worse when Rowan was sick and breathed her feed down into her lungs. We were told that the next few hours would be crucial for her. After this there were several occasions where Rowans oxygen levels would dip and she would need manual bagging to help her breath and lots of suction, this was the milk feed blocking her airway. At this point the doctors told us that without re-ventilating her there was little they could do and discussed moving us to the local hospice. We had to sign a limitation of treatment form and make the awful decision that if Rowan was to stop breathing or run into further complications that we did not wish her to be resuscitated or have any other alternative treatment. We arrived at Bluebell Wood Children’s hospital on Tuesday 2nd October here we made the heart breaking decision to remove all of Rowan’s breathing support. We decided that she was just as likely to block her airway with the mask on as she was to struggle with it off and if we only had a little time left as a family we wanted to enjoy it as comfortably as possible without equipment coming between us. The non invasive ventilation mask was therefore removed. At the hospital we had been told that Rowan would only survive a few hours without it and it looked like this was correct - she seemed to be struggling. Everyone surrounded her in that small room and said our final goodbyes. It was suggested that Rowan might like a bath as she hadn’t had a proper bath for nearly two weeks, everything was prepared and Rowan loved it. It brought her round so well and within minutes she was attempting a little splash. We started to consider going home, and after a 2 week stay we did just that. Once again things returned to our ‘normal’ however neither of us went back to work we wanted to spend as much time with Rowan as possible. The suction machine (our Nu Nu) became our best friend and we were also given a nebuliser machine to try and help with Rowans secretions both these pieces of equipment saved Rowans life on numerous occasions along with routine chest physio. We took it in turns, having a night on and a night off to be by Rowan’s side in case she struggled to breathe. On Friday the 23rd November following an unsettled night for Rowan I awoke and looked outside – clear blue sky and sunshine. I knew today would be the day that Rowan left us. Later that day while cuddled on the sofa with Matt and I, Rowan took her last breath and gently let go of my finger. She passed away peacefully in her own home surrounded by love. Rowan delighted everyone she met and enjoyed her short life to the full. She made the world more fun, more interesting, more beautiful and above all, more joyful for everyone close to her.